Having seen Dee Ex Bee turned over at a short price in the Acomb Stakes 24 hours earlier, trainer Mark Johnston had the smile put back on his face as Threading justified her £15,000 supplementary fee in landing the six-furlong Group Two contest. Eased into the race by James Doyle, the 9-2 winner sailed past American hope Happy Like A Fool approaching the final furlong, before crossing the line a length and three-quarters clear from Madeline, to make it two from two following her debut success at Goodwood. Irish raider Mamba Noire from the yard of Ken Condon was a further three-quarters of a length back in third. Threading was introduced at 12-1 for next year's Qipco 1000 Guineas by Paddy Power, with Betfair going 14-1. 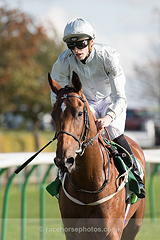 Doyle said: "It's a bit early to tell if she is a Guineas filly. She is showing all the right signs and she was very impressive in deep ground at Goodwood. I rode one yesterday that was an impressive winner there and he flopped so it is hard to tell how much it quite takes out of them. "She seems to have come on nicely from that run. I was always comfortable there. I didn't want to give Frankie (Dettori, on Happy Like A Fool) too much rope, I got there a touch early but she is a typical one of Mark Johnston's and she toughed it out well. "She rides like an older horse, to be honest, she is very push-button. She jumped well, sat a couple of lengths off the pace, eased into it well and knuckled down well late on. She is very professional."